Attendees at the 2011 Queensland Supply Chain and Logistics Conference dinner were able to raise over $20,000 for EMQ Helicopter Services. The pilots and crew of the EMQ Helicopter Services were the heroes of the floods that hit Grantham and the Lockyer Valley on the 10th of January 2011. The pilots of EMQ Helicopter Services led by Chief Pilot Mark Kempton were responsible for rescuing over 40 people. The 2011 Queensland Supply Chain and Logistics Conference dinner attendees had the opportunity to hear Mark Kempton’s tale of heroic acts in unspeakable conditions. Though they were able to rescue 28 people in the flood-devastated Queensland town of Grantham, Mark regrets that he couldn’t rescue everyone who needed help that day. In an unpleasant twist of fate, Kempton returned to his house after saving people to find it had been submerged by the flood waters. His selfless efforts, delivered when his own wife and children were being evacuated from their flooded home saved the lives of 28 people. Over a period of two and a half hours on that Monday afternoon in January, Mark Kempton and his EMQ Helicopter Services crew from Archerfield winched 28 people to safety. Another EMQ chopper rescued 15 more. 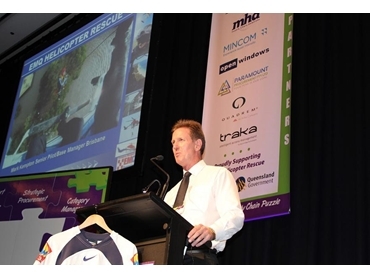 Over $20,000 was raised during the 2011 Queensland Supply Chain and Logistics Conference dinner for EMQ Helicopter Services. The Queensland Supply Chain and Logistics Conference thanks Haymans Electrical Services for once again sponsoring the evening and also acknowledges the efforts of Fuji Xerox in bringing along Liam Gill, Reds player as well as OfficeMax for bringing along Amy Steel from the Firebirds. The SCLAA, Queensland Division also announced the winners of the QLD SCL Awards at the event. To date, the Queensland Supply Chain and Logistics Conference has raised over half a million dollars for various charities.